S. S. Stewart Universal Favorite #1 Model 5 String Banjo, c. 1898, made in Philadelphia, PA, serial # 50834, natural finish, metal spun-over rim, cherrywood neck with ebony fingerboard, black tolex hard shell case. This is a very well-used but still good playing example of an 1890s lower-line Stewart with some old funky but solid repairs and replaced hardware, ready for the next 100 years. The tailpiece is a period Elite. The tuners are correct period friction pegs with ivoroid plastic buttons but others have been mounted at some point, leaving marks on the headstock. The fingerboard inlays are simple stars and diamonds, and the headstock carries a very attractive symmetrical inlay with a particularly nice golden patina. The hooks and nuts are a bit of a mixed lot, but the bass side (which is visible to the player) is thoughtfully equipped with the most original examples. The SS Stewart impressed logo and headstock-shaped trademark are stamped on the dowel. The trademark SS Stewart ivoroid plaque is inset into the dowel, with a similar "Universal Favorite" Plaque on the inside rim. Despite its probably eventful life, this is an original banjo with matching serial numbers on the dowel and rim. The original turnbuckle neck adjustor is intact and actually works well. 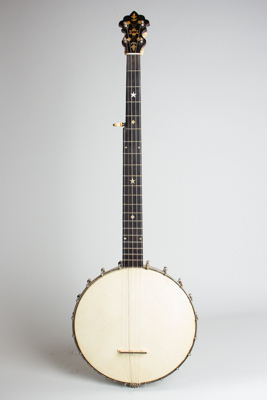 While not a collector's piece, this remains a good "knock-around" old-time 5-string banjo, with a modern hardshell case. Overall length is 35 1/2 in. (90.2 cm. ), 11 in. (27.9 cm.) diameter of rim, and 2 1/4 in. (5.7 cm.) in depth, measured at side of rim. Scale length is 27 in. (686 mm.). Width of nut is 1 1/4 in. (32 mm.). This banjo has what look like very old repairs both at the peghead and tailpiece end of the dowel; they are structurally fine but cosmetically less than perfect. The headstock had a fairly major break long ago; the repair is solid but has only light over-finish work and no attempt to disguise it, and looks to include a reinforcement peg through the fingerboard at the first fret. The dowel has old repair to a split at the tailpiece end, glued up and bound with a metal band but cosmetically sloppy. These appear to have both been solid for some time, and do not present any playability issues. The original finish and plating are in generally good shape with light normal wear. There is very little fret or fingerboard wear. The nut and bridge are newer. The banjo is set up with an older skin head that is a bit overstreched but sounds quite good and nylon strings, and plays fine with a dark and very "old-timey" sound.